I used to have a very grammar-based curriculum I had to teach. I had to teach students when to use 'personal a' in stand-alone sentences with no context. They had to learn the rules for how to know which nouns are masculine or feminine, and memorize common exceptions. They learned irregular preterite verb endings in one fell swoop. When I had a lesson or topic coming up that bored even me (and I'm the teacher! ), then I had a couple activities in my back pocket that will spice up any "write-this-down-and-memorize-it-because-it's-on-the-test" lesson. I know, I know. You're thinking - coloring activities?! In HIGH SCHOOL?! Coloring automatically makes anything more engaging, and it's also calming - even to the craziest of students or classes. Once I taught my students the colors in Spanish, I could include colors in any (every) lesson after that. 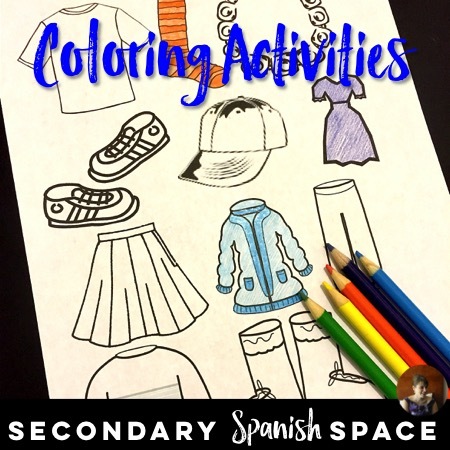 If you are teaching new vocabulary, include a listening activity with colors vocabulary. 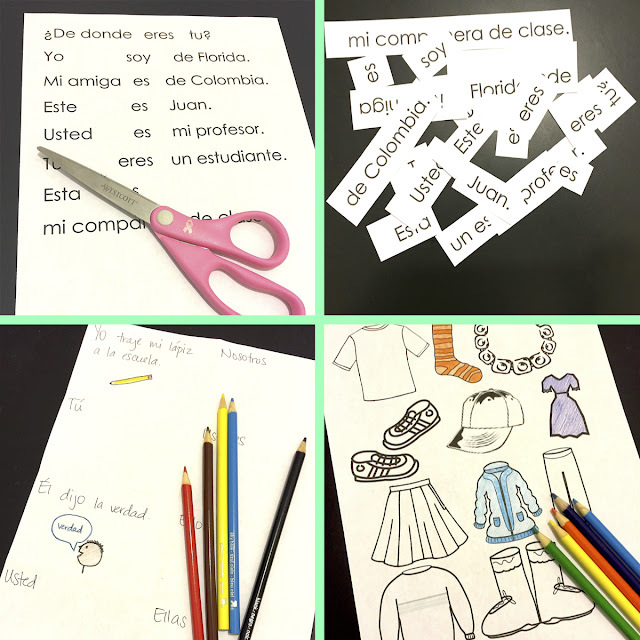 When I taught clothing vocabulary, I gave each student a handout with the clothing items as outlines so they could color them in. 1. I would then say "Los calcetines son anaranjados". 2. Students had to find the calcetines on their handout and color them orange. 3. Then I would go through 5-6 more clothing items and different colors and students would have to listen for what clothing item I was saying and color it the correct color. 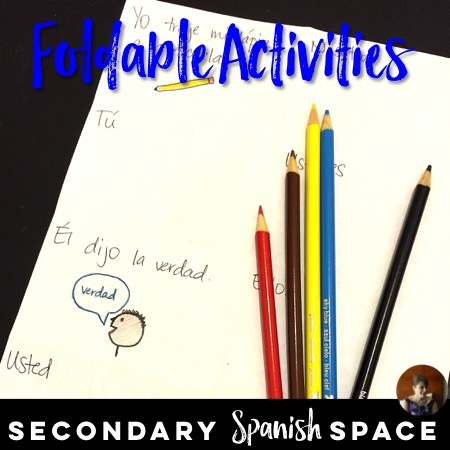 This activity also works for school supplies vocabulary! Foldable activities are great if you finish the lesson and then realize there are still 10 minutes of class left. This has happened to other people too, right? Students love activities where they can manipulate the paper and the activity automatically becomes more interactive. This is also my favorite way to review verbs - forms of ir, all present tense -AR verbs, preterite irregular verbs... literally any type of verb. 1. Pass out one sheet of blank copy paper to each student (steal borrow it from the copy room beforehand). 2. Have students fold their paper into 8 boxes (fold once hot dog-style and then twice hamburger-style). 3. Write a different subject pronoun in each box. 4. Write a sentence with an irregular preterite verb in each box - each box must have a different verb in it! 5. Draw a (pretty) picture to illustrate your sentence. 6. I also pass out the colored pencils at this point because, again, I love coloring. When I taught definite articles (completely out of context because my curriculum was super amazing like that), I would have students fold their paper into 4 boxes and write a definite article in each box, and then list nouns they knew that fell into each category and draw (pretty) pictures of those items. And then color. Because coloring is THE BEST. This activity takes much more prep ahead of time, but if you laminate things and store them safely for next year, then it's worth it. If you immediately throw everything out after the students are done and have to re-do it year after year, then you will curse yourself each year. 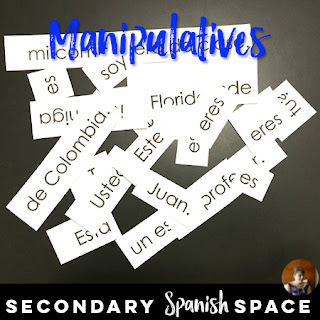 When I taught forms of the verb ser in the present tense, I would type up sentences, that would be cut into three parts for students to put back together. 1. 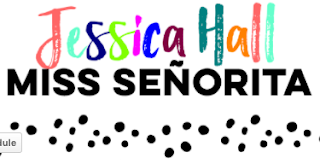 Type up a sentence with each subject pronoun (yo soy alto, tú eres mi amigo, usted es de Colombia, nosotros somos inteligentes, etc). (I recommend using a large font size (20+) and adding extra spaces between words so cutting is easier later). 2. Make enough copies for students to work in pairs. This cuts the rest of your prep work in half. 4. Cut each sentence into three parts - the subject pronoun, the verb, and the rest of the sentence. 5. Put all sentence parts into a sandwich-size baggie. 6. Pass out the baggies to students and have them work in pairs to recreate the sentences. 7. If you are super amazing, then make two different sets of sentences (copy them on different colors of paper so you can easily tell which is Set 1 and which is Set 2) and have pairs of students switch sets when they finish theirs correctly. 8. You can also have students write their sentences down in notebooks or on paper you'll collect later. 9. Plan to definitely have a discussion with the class as to why "usted es mi amigo" is grammatically correct, but not the best sentence. 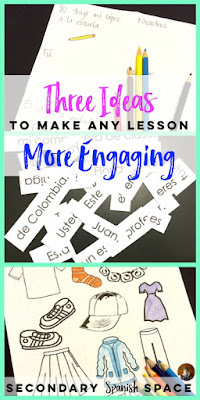 I hope these ideas help if you also have lessons that you dread teaching each year because they are SO BORING. Please share if you have other ideas for activities that can be used across multiple topics to spice things up and engage students!